Radical Prayer #14: Lord, Unite My Heart to Fear Your Name! Have you ever struggled with being double-minded? Especially about your faith in God? Strong in faith one day, and weak the next? I know I have. My life used to be an emotional roller coaster. I was up in the morning and down by lunch. Up and down, up and down. 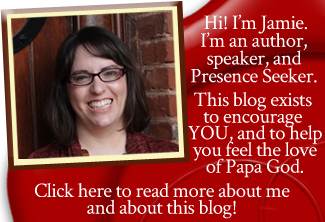 “God, why haven’t You …?” was the cry whine of my life. that I was just going to trust God from then on. The Lord had to bring me through fire to show me that it was a decision; but when He did, there came a point where I had to make that decision. If I had not, I believe He would have taken me back around that mountain one more time, wandering in the wilderness. But, by His grace and help, I did make that decision and breakthrough came soon afterward. Until the day I made that decision, my heart was not right most of the time. I spent a lot of time feeling sorry for myself. I spent a lot of time trying to figure out what was wrong with me. I spent a lot of time whining and being discouraged and depressed. Some days, my heart was after God and set on Him. Some days, I believed Him. Other days, I was just mad at Him. King David must have had the same problem. Teach me Your way, O Lord; I will walk in Your truth; unite my heart to fear Your name” (Psalm 86:11). If David had to pray for his heart to be united to fear God’s name, then sometimes it must NOT have been united. We know David was a musician and a psalmist. We know he had strong emotions from reading his poetry, the psalms. We know he felt melancholy sometimes, discouraged sometimes, depressed sometimes, and angry sometimes. David’s heart was all over the place. Some days he was strong in God, and other days … not so much. But David didn’t hide his weakness from God. He didn’t try to hide his melancholy or pretend it didn’t exist. Instead, he asked God for help to manage his emotions. First, he asked God to teach him His–God’s–holy ways. Why? Because when you understand someone’s ways, you know exactly what they’re doing and why they’re doing it, so you don’t get depressed when things don’t look the way YOU want them to look. Secondly, he told God that he would walk in God’s truth–demonstrating that, even though he needed help to get there, his desire was to follow God with all his heart. And when he asked that, he was asking God to help him STOP being up and down. He was asking God to bring all the pieces of his emotions back together into one heart that would run fiercely after God. He asked God to change his heart so much that he, David, would stay solely focused on God in faith. Do you need God to unite your heart? I know I do. Even though I’ve decided that I’m going to stand in faith, I sure need God’s help to do so! I need Him to search me and know my heart; to try me and know my thoughts; to see if there be any wicked way in me–and if there is, to GET IT OUT!–and to lead me in His way everlasting (Psalm 139:23-24). I need His help in everything. I even need His help to believe Him, trust Him, and stand on His Word. 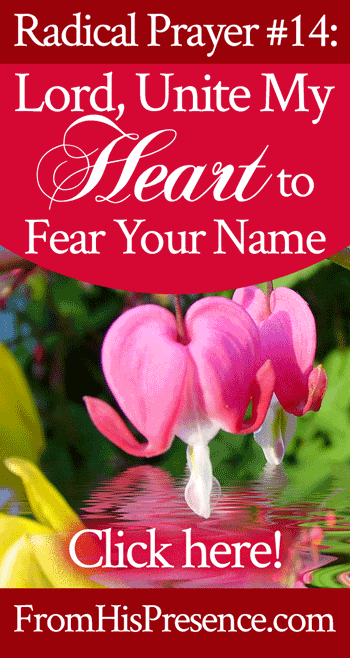 If you struggle with up-and-down emotions, ask God to unite your heart to fear His name. Ask Him to pull the pieces of you back together into one united heart toward Him. Ask Him to take away the old heart that was shattered in a million pieces, and give you a new heart–His heart. Ask Him to help you stand firm in faith without wavering, like Jesus did. Ask Him to help you cast down every imagination and every high and lofty thing that exalts itself against the knowledge of Christ. Ask Him to help you set your mind and keep it set on things above, where Christ is, seated at the right hand of God. Ask Him to help you take every thought captive to the obedience of Christ, and to dwell in the secret place of the Most High, where you will remain stable and fixed under the shadow of the Almighty, whose power no foe can withstand (Psalm 91:1-2). Father, thank You for giving me Your holy Scriptures to learn from. Thank You that You have a solution for everything, including my wild emotions. Father God, I need Your help In Jesus’ name, I ask that You would please unite my heart to fear Your name. Take away my old, shattered heart, and give me a new heart–Your heart. Let Your heart beat in my chest, Father, and help me be wholly devoted to You. Father God, please help me to set my mind and keep it set on things above, where Christ is. Help me to cast down every imagination and every high and lofty thing that exalts itself against the knowledge of Christ. Help me to take every thought captive to the obedience of Christ, Lord, and to stand firm in faith without wavering. Help me to dwell in the secret place with You, and please keep me stable and fixed under the shadow of Your wings. Father, in Jesus’ name, I also pray for revelation about who You are. Let Your Holy Spirit of wisdom and revelation would give me more revelation than I’ve ever had about how holy You are. Teach me how awesome You are: how mighty, how strong, how reliable, how dependable, how faithful, how true. Show me Your glory so strongly that I am gripped by the wonder of You. Father, help me to fall more in love with You every day. Help me to fall more in love with Jesus every day. Give me a heart that is wholly devoted to You. Help me to decide to trust You with all my situations, all my circumstances, and everything I see around me. Help me to make the decision every moment of every day to keep my eyes on You and trust You, no matter how I feel. Thank You, Father. Thank You for hearing and answering my prayer. Thank You for uniting my heart to fear Your name. Does this word and prayer from the Psalms minister to your heart today? Did you pray the prayer and ask Father to unite your heart to fear His name? If so, leave a comment below! I’d love to hear from you! I am so grateful you shared this. Yes, I seem to be up and down on an emotional roller coaster. I read Psalms because it does calm my heart. I am glad that Papa God understands and will help me to be more stable!! You are right about it being a faith decision to trust God. I am tired of going around the mountain! I choose by faith to just trust God! Every time I do it gets a little quicker to choose to trust Him! He is most certainly worthy!!! Hi, im so incredibly blessed to read each and every email. You always speak to the core issues im dealing with and your messages are always on time and on point in my life. May Father continue to use you and bless you always! Lotsa love my precious AWESOME sister. May the good Lord bless you Jamie, our mentor!!! I thank God for your ministry and I thank you for for being obedient to God. This devotion is helping me and I truly need this push or strength this morning. Blessings to you. This is exactly how I feel almost everyday, no matter how I try I can’t fight it. Reading this somehow relieves me. Thank you once again Ms. Jamie. Thank you for this word of encouragement and for relating to my journey. I appreciate this prayer and ask that you would continue to pray that we be united to the Fathers heart and fear His name. ?????? Thank you for helping me learn how to pray. Thanks again Jamie. Your words have given me new revelation today about my life. You have spoken directly into my my heart about my need to unite with my whole body mind and heart with God. Thank you Jamie God bless! Every email I get from you is so timely. My spirit resonates with the heart of this prayer. Thank you for sharing this powerful prayer! May your ministry be so blessed in this next year that every need you have be provided for. I speak blessing of wisdom and peace over you and your husband as you parent your little one. May the love of the Father flow out of your lives and minister as you teach this little one to know Jesus! Thank you for your heart, your love and your ministry to many! Thank you; I am really struggling. I have been having all kinds of attacks by the enemy in my dreams. I am exhausted and want to give up the good fight of faith because I am so scared and want to quit having these threatening dreams. Thank you again. Amen… I desperately needed this prayer, I see my double mindedness and yearn for the Holy Spirit to live powerfully instead of my flesh… So your message was right on time!! Thank you, and my God continue to bless you.. I thank God I happen to come across your blog…and I saw you addressed our Father God “Papa” and was overwhelmed n surprised. Because not very long ago I woke up n distinctly heard in my spirit ” Papa is here”. I’ve been going through a lot of heartaches n crying out to God. When I saw that you too addressed God Papa..I knew this was the place His Spirit has led me for my emotional healing, peace n Joy. Thank you, Jamie n God bless the work of your hands in Jesus’ Name. Amen. Jamie, this is exactly what I needed! Thank you for this timely word and prayer! I need God for every moment and this focused in on His heart and mine in a way that helped me get beyond just needing Him to survive, but to thrive! This was exactly the correct moment in my life to hear and pray this prayer. I thank the Lord for using you to deliver this incredibly timely word from Him. I thank God so much for planting you in my life Jamie.. God bless you abundantly sister..you have been an inspiration,you have encouraged me..due to personal reasons I lack fellowship and you fill that void by constantly mentoring through your website..
Bless you, Bless you, Bless you! I have been struggling with these emotions for so long and this morning as I opened up your email the title just gripped me. I am suppose to be out working but it is raining so I had to come and take a break and here in my break time God used you to minister through word and Prayer! Thank you!